If you one of the millions of ladies who desire to get rid of those pesky pounds that make your jeans tighter and breath shorter, maybe you just need a little motivation. 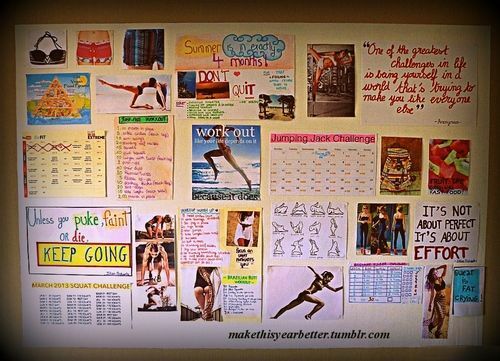 A motivation wall is an excellent choice if you want to be reminded daily that you will no longer live an unhealthy lifestyle. I’ve struggled with my weight ever since my daughter was born, and I just can’t seem to finally get back to my pre-pregnancy weight. 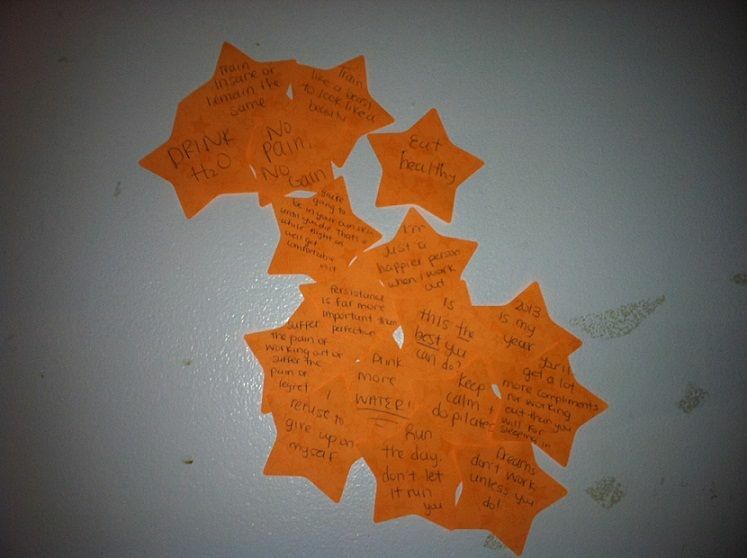 I recently bought Post-It Notes to plaster on my wall in order to keep myself in check. Above is the beginning of my “motivation tree”. I wrote down short motivational messages on Post-It Notes, and it’s going to form a tree once I place enough on my wall. My motivation tree is above my computer desk. I spend most of my day on my laptop, so it’s the perfect place for me. You want these messages to become engraved in your mind. 1. Choose a spot that you look at multiple times daily. For me, it’s my wall above my computer desk. For you, it might be your bedroom wall or even the refrigerator door. 2. Be creative! You don’t have to make a motivation tree like I’m doing, and you don’t even have to use Post-It Notes. You can thumbtack your “dream jeans” onto your wall to remind yourself that those dreams are the end goal. That’s why you’re putting yourself through those hours and hours in the gym and those healthy meals you don’t really want to eat. You can use magazine cut-outs or images you found on the internet, also. 3. If you use quotes, keep them short. You’re not going to want to read a novel when you glance on your wall getting ready for work in your bedroom or when you’re grabbing a bottle of water from your fridge. However, if you find a quote that you’re in love with that just so happens to be lengthy, go for it. 4. Write legibly. I made that mistake. I look at some of the stars and question “what’s that word?”. After writing so many motivational and inspirational quotes, my hands started to ache and that decreased the legibility of my handwriting. If you notice that your handwriting is starting to stink, stop for the day. Feel free to use these to start you off, or you can just google some that are tailored more for you. Another site that has an abundance of health and fitness quotes is Tumblr. You just have to follow Tumblrs from that niche. Train like a beast to look like a beauty. You’re going to be in your own skin until you die. That’s a while. Might as well get comfortable in it. I’m just a happier person when I workout. Persistence is far more important than perfection. You’ll get a lot more compliments for working out than you will for sleeping in. Keep calm and do pilates. I refuse to give up on myself. 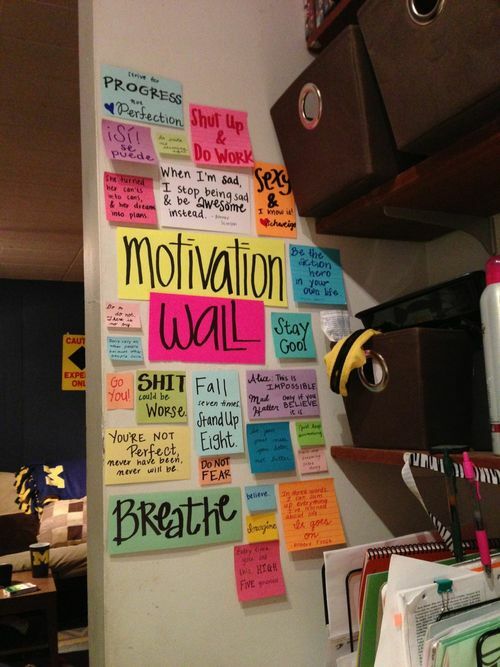 Below are few of my favorite motivation walls. Use them as inspiration or create one that is all you. Have fun with it! This Tumblr blogger used inspirational photos and workout routines from US Self magazine and photos she found on Tumblr. I have a binder full of workout routines, but this seems more efficient as you’re constantly reminded to do the routines. 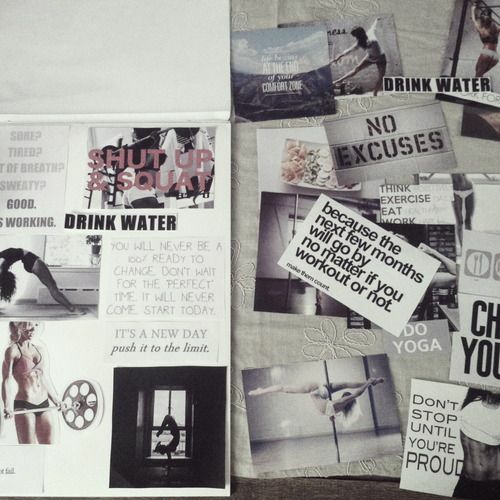 Hannelouise used “fitspirational” quotes and images from Tumblr that she printed out for her motivation wall. This wall is probably my favorite. She uses BRIGHT colors so her eyes will gravitate to the messages. One of the more elaborate ones I’ve seen. I’m actually going to implement the use of workout challenge calenders. Like what you see? 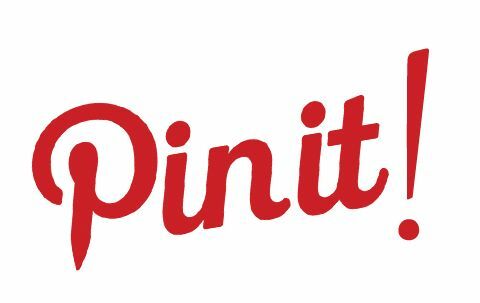 Pin it by clicking the image above and share with your friends! I love this! I have been trying to lose weight and this would be a nice reminder to keep me focused! Thank you for posting this. I plan on making a few walls in my place. I need to stay motivated. How to Save on Luvs Diapers!